Find the newest Victoria real estate listings and homes for sale below. 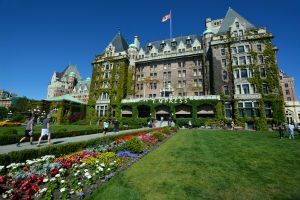 Victoria is BC's capital city and it's a community with a charming, old-world feel that's famed for its gardens, British-style pubs, and mild climate. Home buyers will find many great neighbourhoods in areas of Victoria BC that are vibrant, such as the downtown district with its historic properties as well as quiet residential areas like Fairfield and Rockland. Read more about Victoria real estate. Buying or selling a home in Greater Victoria? Call The Neal Estate Team at 250.386.8181. Our community of Victoria real estate agents will help you navigate the Greater Victoria housing market. THE RON NEAL TEAM ARE GREATER VICTORIA REAL ESTATE EXPERTS! The Greater Victoria real estate market encompasses communities that span across the entire southern tip of Vancouver Island. This housing market is made up of a diverse and varied collection of neighbourhoods, each of which attracts a different demographic, features different architectural styles, and is host to its own wealth of attractions and amenities. And Victoria house prices vary greatly, so this housing market is suitable for all budgets and styles of living. Potential buyers who may be working professionals, or simply value walkability, should tour the high-rise apartments and condo properties for sale along the inner harbour in Victoria's Downtown. In the areas surrounding some of Victoria's most famous landmarks, such as the Parliament buildings and the Royal BC Museum, locals enjoy restaurants with flavours from around the world. Enjoy live music, a dynamic nightlife, and incredible views of the harbour. The Greater Victoria area is more than a city made up of apartments and condos on the market. Buyers can find affordable homes for sale on the other side of Johnson Street Bridge in Esquimalt neighbourhoods where the Canadian Forces are stationed. Or revel in the small-town charm of the municipality of Oak Bay, where restored heritage homes can be found and streets are quaint and residential. Discover the wealth of neighbourhoods that belong to Saanich. Gordon Head shoots off of the University of Victoria and is the chosen neighborhood of many families and students because of its affordable real estate pricing, quiet streets, and convenient location close to some of Victoria's best schools. Cadboro Bay is a peaceful area made up of handsome Arts-and-Craft-style houses situated near the golf course and marina. Lining the east shore of the Gorge, find the residential neighborhood of Tillicum where new construction is plentiful and amenities are always nearby. Waterfront and waterview Victoria homes for sale can be found in neighbourhoods like James Bay and Fairfield, while Fernwood, Burnside, and Rockland are leafy residential neighbourhoods perfect for families. A wide variety of waterview homes and condos for sale. Mild weather all year-round, thanks to the Westerlies and Pacific Ocean currents. Beautiful neighbourhood parks in the city, with a short drive to the great outdoors. World-class shopping and dining, with 3 major shopping malls in the City of Victoria. Homes and condominiums in many different price ranges. When it comes to the types of Victoria BC property for sale, even the most discerning buyer can find what they're looking for in the Greater Victoria housing market. Victoria homes for sale range from bachelor suites, ideal for students and single professionals, to multi-million dollar estates with floor plans that unfold over several thousand square feet. Home buyers have the power to choose if they'd like a recently-constructed single-family house that will be free of the issues that accompany older real estate, versus a character home on the market that's full of historic detailing, custom work, and personality. When it comes to condo properties and apartment buildings, there is no shortage of suites for sale that spread throughout the city. Whether buyers are searching for a complex along the east shore of the city in Oak Bay or in the walkable heart of the city, buyers will have options. With numerous shopping and retail corridors spread throughout the city, those living here never have to be concerned about a shortage of community amenities. There are even plenty of rural Victoria properties on the market to choose from. The estates along Blenkinsop Road sit atop expansive acreages and many of the residents living there have transformed the land into active farms. North of the city, the district of Metchosin is another popular farming community. Whether in the market to purchase a small suite property close to top amenities, a comfortable family home to raise kids, or an expansive acreage to enjoy Victoria's incredible weather, buyers won't be disappointed. Listing prices range from under $100,000 to beyond a million depending on the size, luxury, and location of the home. The Neal Estate Team are the Victoria, BC real estate experts. If you're searching for a home or investment property in Victoria, put our expertise and local experience to work for you!